These notes were prepared for a dinner talk at the Bay of Quinte Yacht Club on the painting by Peter Rindlisbcher, CSMA, of the Atalanta in March 2012; an image of the painting appears below. Top mast : 32' 2"
In 1851, the America won the "hundred sovereign" cup from a fleet of 15 Royal Yacht Squadron yachts. The first Deed of Gift was established in 1857. Lord Ashbury challenged unsuccessfully with Cambria in 1870 and Livonia in 1871. The RCYC challenged unsuccessfully with the Countess of Dufferin (also designed and modelled by Captain Alexander Cuthbert) in 1876. Bay of Quinte Yacht Club (BQYC) sent their challenge on 16 May 1881, naming Captain Alexander Cuthbert's yacht Atalanta. The challenge was accepted 12 June by the NYYC. [In Greek Mythology Atalanta was abandoned as a child, raised by bears, rediscovered by her father who looked to marry her; not interested she bet her suitors could not beat her in a foot race, which did not happen until Melanion distracted her with golden apples. She possibly sailed with Jason and the Argonauts.] 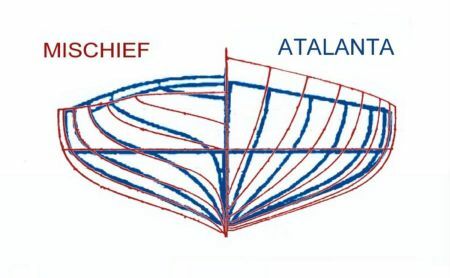 Atalanta was the first sloop rigged challenger. Construction had started at the Flint & Holton lumber yard (West bank Moira River, Belleville) in the early spring of 1881. The Atalanta was designed, modelled and built by Captain Alexander Cuthbert of Coburg, reportedly at a cost of $2,100 [C.H.J. Snider], as an improvement to his Annie Cuthbert [he also designed Countess of Dufferin, Dauntless, Surprise and Katie Grey.] Chronically short of money, he was the only man in history to be designer, modeller, builder, owner and skipper of an A.C challenger., and where his backing - if any - for the Atalanta came from is somewhat of a mystery. In June, BQYC requested that a single yacht be named as defender; NYYC accepted. During the summer of 1881, a syndicate from the NYYC commissioned a $20,000 sloop rigged, potential defender Pocahontas. Launched late (17 September 1881) the Atalanta was not finished. Her planking was not planed down and her fittings were almost unfinished. Money was lacking and work had stopped several times to wait for cash. When the boat sailed down the Bay of Quinte, the crew were still nailing down her deck and other fittings. The suit of sails was brand new, ill-fitting and the cotton duck had not had time to lose its nap. Due to this delay, Atalanta had had no time to sail the St. Lawrence-ocean course to New York if she was to reach the venue in time. Instead, she was forced to take the short route entering the Erie Canal at Oswego. But the beam was too wide for the locks, the crew shifted ballast to one side to heel her over. Then a team of mules towed her and the boat got the nickname of "The Canadian Mud Turtle". From the 13th to the 20th October, the NYYC organized the defender trial races between Pocahontas, Hildegard, Mischief and Gracie. When Atalanta reached the Albany end of the Canal, the crew shifted the ballast back, stepped the mast and set sail for New York harbour arriving on October 30th, 1881. The same day, the NYYC began preparations for the challenge races planed for November. Many of the crew promised from Belleville didn't come to join Atalanta. In a hurry, the team was complimented by a number of amateur sailors from the Oswego Yacht Club, and possibly some "Norwegian steam" in New York. Some last minute modifications were made - shortening the mainmast and re-cutting some sails. Afterguard: J.S. Mattoon, J.B. Donnelly, W.B. Phillips, W.S. Stone, and Captain Nicholas Dand. 8 November, Mischief named as defender, race cancelled due to fog and light air. 9 November, 1st race, 32.6 miles, "inside course" (triangle), fresh Sou'Wester: Atalanta started reefed, added then struck tops'l, shook out reef, added then struck tops'l; Mischief started with a full main then shortly added her tops'l; both boats set and struck a balloon jib top on the downwind leg. 10 November, 2nd race, 32 miles, "outside course" (leeward windward): Atalanta did fairly well downwind, losing only 2 min 15 secs at the leeward mark. 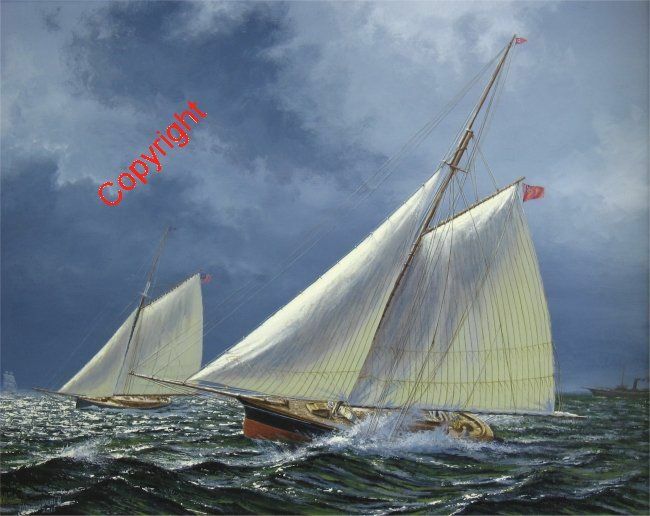 As to sail changes Atalanta started with her tops'l and reefed main, Mischief with a working tops'l and full main; both set a balloon jib tops'l, but Atalanta broke her pole; both housed their topmasts for the return leg, Atalanta double reefed, Mischief single reefed. Result: Mischief beat Atalanta two wins to nil. "Atalanta", Peter Rindlisbacher, C.S.M.A., oil on canvas, 16" x 20", 2011. The poor sailing of Atalanta forced the NYYC to change the Deed of Gift so that the challenger should belong to a yacht club situated on an arm of the sea, thus excluding the freshwater Great Lakes, and had to sail on her own bottom to New York. It is possible to conclude that the Atalanta lacked preparation and crew training. The state of her bottom and sails left much to be desired. It might also be said that under the right weather conditions she could have been much more competitive, if not a winner (c.f. her later successes on the Great Lakes.) She and Pocahontas were the first yachts ever designed and built specifically for the America's Cup -- the latter at nearly ten times the cost. 1882 : Atalanta was sailing on Lake Ontario. 1883 : The sloop sailed to Chicago to race in the Fisher Cup. She was leading the race when she broke her spinnaker boom and was beaten by Cora. After completing the repairs, Cuthbert beat Cora by 16 minutes, during a private match on the same course, and took back the Fisher Cup to Bay of Quinte. Atalanta held the trophy until 1886. 1896 : Atalanta was partly burned. Sold and taken to Chicago where the sloop was rebuilt with higher topsides and flush decks. 1900 : Atalanta was last seen in New Orleans.